Aquarists keep freshwater shrimp for a variety of reasons. For some, shrimp are interesting components of an aquarium community. Other hobbyists enjoy maintaining tanks that showcase large, exotic species, while still others culture shrimp solely as a food source for other fish. Regardless of the hobbyist’s goals, freshwater shrimp require captive environments reflecting their wild habitats, specifically as it relates to temperature, dissolved oxygen, pH and other parameters. Keep shrimp in aquariums with at least 10 gallons of water so they have plenty of room to move around. As most species kept in aquariums are bottom dwellers, floor space is usually more important than water depth. Generally speaking, shrimp thrive best in dedicated tanks, without fish or other animals. 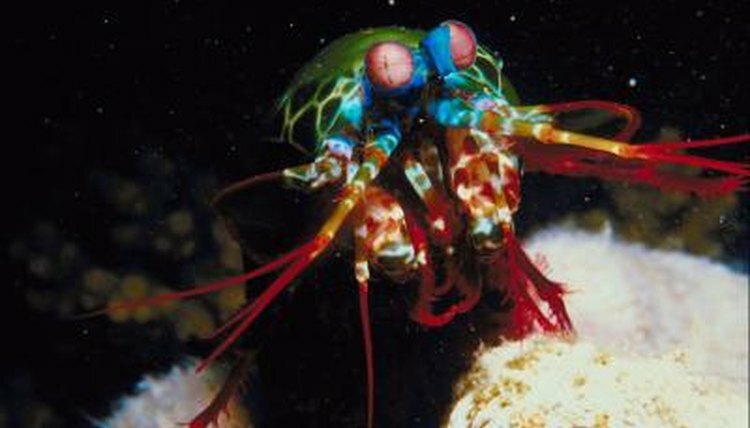 Aggressive fish may eat the shrimp or aggressive shrimp may eat the fish, and both may require different water chemistry than each other. However, some shrimp and fish can cohabite well. Amano (Caridina multidentata) and wood shrimp (Atyopsis moluccensis) will not bother or be bothered by small, nonaggressive species, such as small tetras, least livebearers (Heterandra formosa) and African flame barbs (Barbus jae). While you must research the exact needs of your pet’s species, most freshwater crustaceans live in cool, oxygenated water. Warm tank water will cause crustaceans to grow faster and molt more rapidly, which may shorten their lifespans. Freshwater shrimp do not typically require heat, often thriving at temperatures between 66 and 77 degrees Fahrenheit. The tank’s filter will likely add enough dissolved oxygen to keep the shrimp happy, but if you feel the need to add more, you can use an air stone or similar device. The pH needs of each species vary with their geographic origin. Most species prefer slightly alkaline water, with a pH of 7.2. Others prefer acidic water with a pH as low as 6.5, while some require alkaline water, with a pH of up to 7.5. In all cases, you must match the pH of the tank with that of your shrimp’s native waters. Some shrimp may display slightly better coloration when kept in slightly acidic water. Most shrimp require moderately hard water but, as with pH, precise requirements vary with the species. Virtually all shrimp are vulnerable to pollutants such as anti-parasite medications and copper. Most shrimp tanks will require some sort of filtration to keep the water clear and safe for the inhabitants. A variety of filters work; sponge filters are among the most effective, but hang-on-back filters work as well. Canister filters are often overkill for shrimp tanks, and their powerful pumps may cause inappropriate current levels. No matter what type of filter is used, you must place some sort of sponge or mesh over the inlet tube to prevent the filter from sucking in the shrimp. Aquatic plants can help to foster good water quality, as well as provide the shrimp with cover and food.